LG has unveiled the A520 laptop – describing it as a powerhouse notebook with 3D entertainment. The LG A520 brings what LG is calling 'revolutionary 3D technology' in the shape of Film Patterned Retarder (FPR) which "optimizes the separation of images for the left and right eye, which are then filtered through the glasses to give viewers truly outstanding, blur-free 3D images". The 15.6 inch laptop also boasts a Full HD LED LCD screen, and SRS Wide 3D sound., along with second-gen Intel Core i7 processor and a Geforce GT540M graphics card. "The notebook further boosts the 3D entertainment with its Blu-ray playback, Bluetooth 3.0+HS, and HDMI," boasts LG. 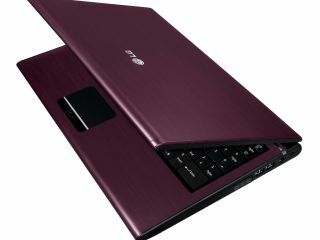 "The A520 comes in a luxurious, brushed-aluminum finish, and is available in attractive purple-black and wine-red coloring." The LG A520 has been given a tentative UK release date of Q1, with no price announced as yet.